Despite winter’s best efforts to stick around permanently this year, spring has finally arrived in the Hudson Valley, its bright greens and cheery yellows pushing the muddy browns and drab greys into the background of our consciousness. Walking through the grounds at Clermont this season however, one notices some unusual splashes of color here and there that aren’t usually part of springs vocabulary, encouraging closer inspection. A teapot and cups dance on the trunk of a tree. 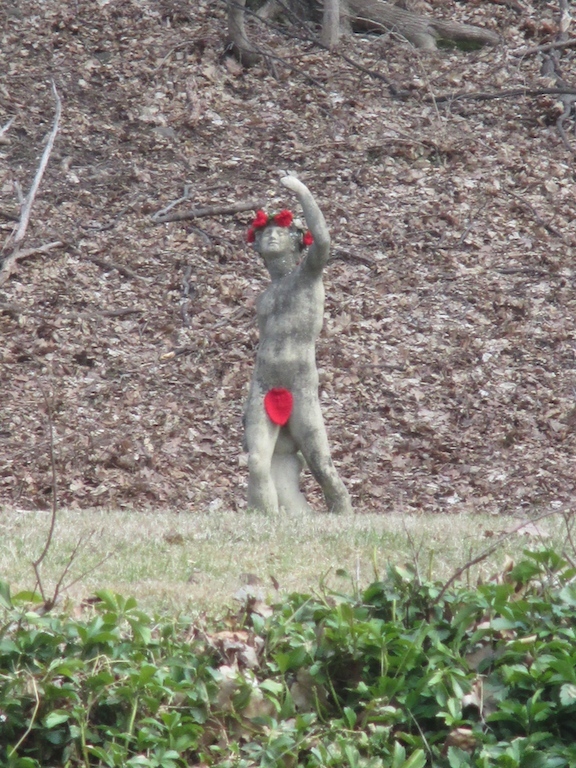 A blue mouse scampers down a branch.Bacchus sports a scarlet fig leaf and a wreath of roses.A chartreuse ewe gazes out over the Hudson and the Catskills beyond. Fear not. No one has slipped you a tab of LSD, nor have you fallen through the rabbit hole into wonderland. You have stumbled upon the Yarnburst at Clermont. 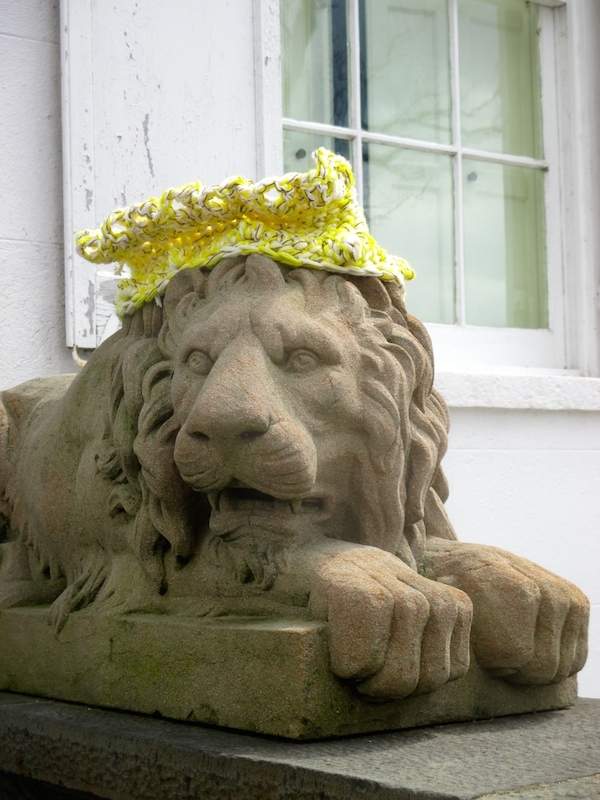 Yarn bombing, yarnbombing, yarn storming, guerrilla knitting, kniffiti, urban knitting or graffiti knitting is a type of temporary or street art that employs colourful displays of knitted or crocheted yarn or fibre rather than paint or chalk. Usually associated with urban settings, this is one of the first instances where this type of installation has been done in a natural and historic setting. Over 40 groups and individuals from the area have all taken part to create this slightly surreal, but undeniably fun experience. 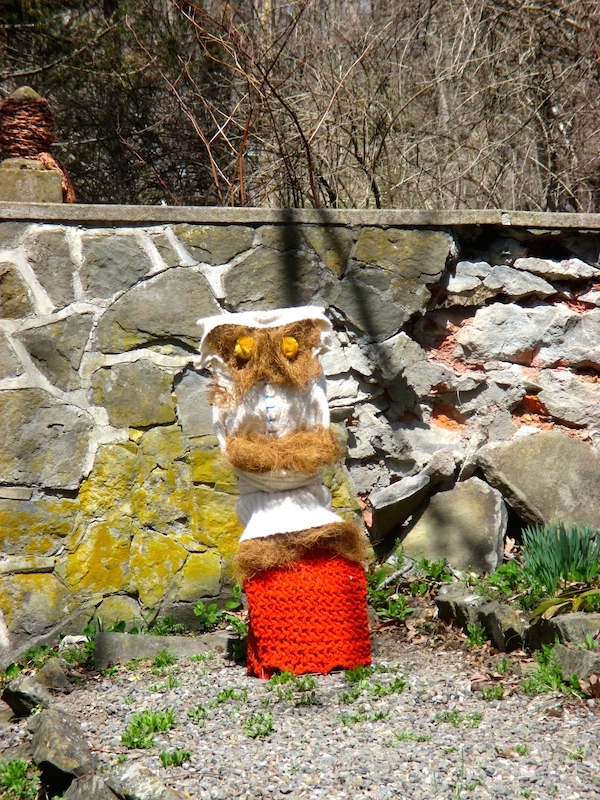 Entering the grounds of the park, the utilitarian tollbooth has been blanketed by the Perfect Blend Yarn and Tea Shop. Parking in the lot, one immediately begins to spy sheep of all colors and styles, from relatively naturalistic models to gussied up gals to pompom extravaganzas. In between are flowers and patchwork insets on trees and shrubs.Even the handicapped parking signs get in the act. Heading towards the mansion, not only is the statue of aforementioned bacchus adorned, but a lead falcon sports a shrugand the king of the beasts guarding the front steps currently wear crowns. 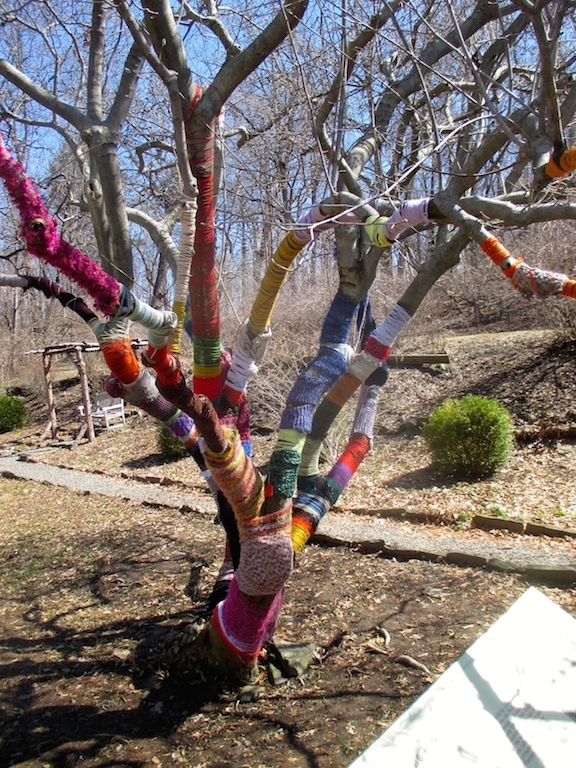 In the walled garden the Clermont yarn bomb experience comes to full flower where a magnolia tree has been wrapped by the Mill Street Loft Arts Collective in Poughkeepsie. Magical flowers, a birdbath, ring-like sculptures and a monster created by Tivoli-based artist Ramon Lascano grace the beds. A morning glory vine grows up an arbor finials wear little capsand a comfortable bench become that much more inviting. 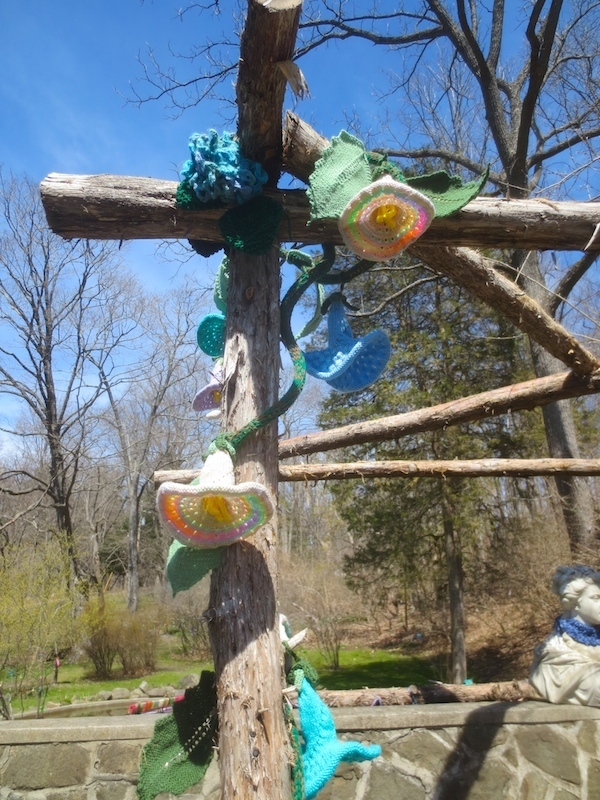 As reluctant as one is to leave this place – passing through the gate into the wilderness garden, a true tour de force of yarnbombing awaits, from a turtle on a rock to ripe fruit to small animals scurrying up the branches of a shrub. 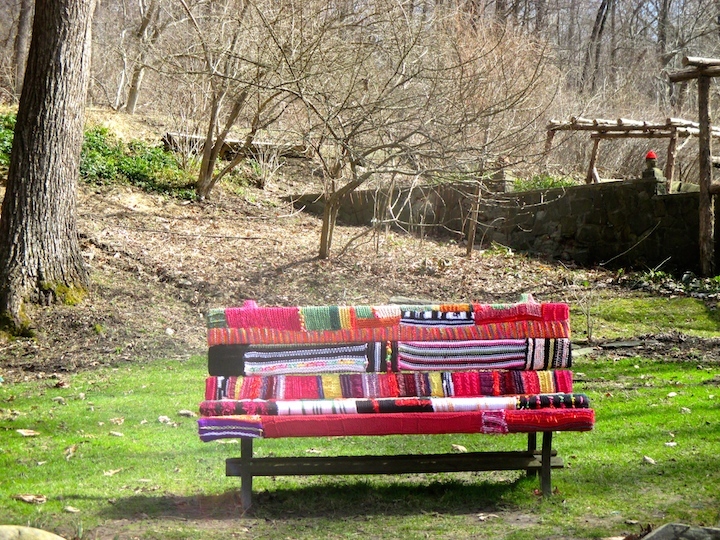 All next to this bench, totally enveloped in perfectly fitting, interestingly patterned yarn. Continuing up through the garden path, one crosses a brightly decorated bridge festooned with banners. It is worth looking for little birds here and there. 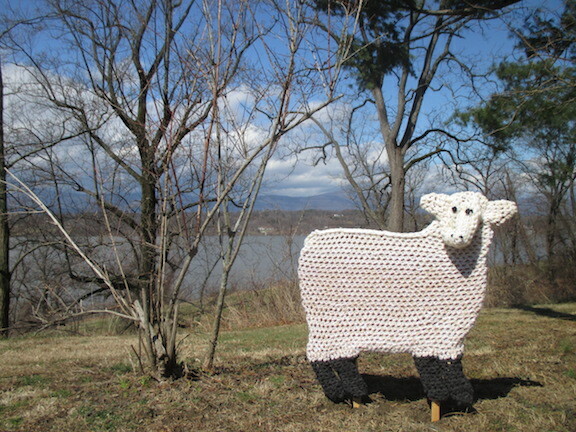 The burst ends in the upper cutting garden, with yarn on fences, benches, and one last little lamb. Whether you like yarn, crafts, or even just the integration of a community art project with a historic site, one thing for certain. It will definitely put a smile on your face. 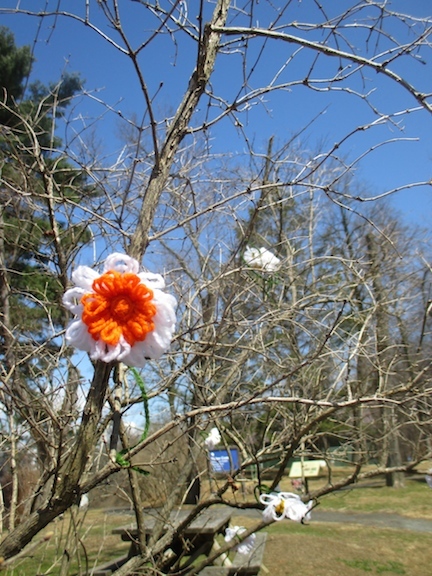 The Yarnburst at Clermont is viewable whenever the grounds are open this spring, until mother nature forces it to be taken down, so see it as soon as you can!